When deciding how to decorate the nursery for Liam, there was one thing that was clear; it would be nerdy! We were debating between Star Wars, Harry Potter and superheroes. It was a tough choice that inevitably leaned toward superheroes because it felt like it covered both of us equally where Star Wars is a little more Bryan’s fandom and Harry Potter is a little more mine. I have had a few family members ask – you are really going with that for the nursery? Yes. Yes we are! They were so surprised by all the amazing resources out there to actually make it happen, too. 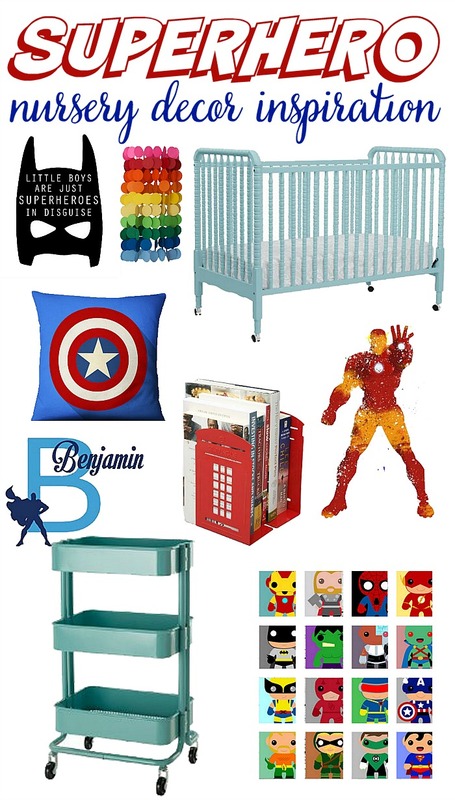 The goal for our Superhero Nursery is to have wonderfully nerdy details without going over the top. For us, this means our focus is on great, bright colors. After looking at lots of options, red, aqua, navy, and white became our main colors with pops of yellow, green and other primary colors. Insert mini rant here – I am shocked by the back of primary colors offered in baby stuff. It is so easy to find pastels and even jeweled tones, but primary colors are really lacking. This definitely affected some of our decisions, needing to tweak our vision at times for what we could find. Now, let’s get to some details and ideas! Some of our details have been finalized and some are still in flux as August will be the time we finally start getting everything set up. In fact, Liam’s room is still storage for things we need to donate; Bryan is emptying it out when I am out of town for a family baby shower this weekend. We struggled with what color wood to use for the crib, especially because we knew we were going to get the Hemnes dresser from IKEA and finding a wood that matched was difficult. Then, I walked into a baby store and fell in love with the floor model of this Jenny Lind 3-in-1 crib in Lagoon (aqua). It just felt perfect for our style, and I loved how easy it was to adjust for a boy or a girl. The dresser will be white as well as the book shelf we intend to get for the room. We also have a red table from Target that we bought a few years ago which we will be using and a aqua blue kart from IKEA that I am obsessed with and will probably serve as our diaper storage station. There are a ton of adorable superhero linen on Etsy by people making custom orders from fabric, but they are pricey. If our carpet and paint did not have brown tones, I might have even gone with an aqua, black and white nursery because there were some awesome Batman ones. However, we wanted color! Instead of spending the money on custom sheets, which will need to be changed and washed more often anyway, consider buying a cute, custom crib skirt. It will stay on the crib all the time so you get your money’s worth AND it can create a space for hidden storage under the crib. Then, find more affordable crib sheets with corresponding colors that you can switch out easily as needed. Etsy is an amazing resource for wall art because you can find unique pieces in all forms, perfect if you going with a less common theme like superheroes. If you want pre-framed art, you can find it. If you want pallet art or canvases, you can find it. We have chosen prints that we could digitally download as they were less expensive than purchasing already printed pieces, and I love that I have the ability to adjust any background colors too if I want to make the room more cohesive. These are going over the dresser. For over the crib, I think we are going more theme neutral – possibly finding letters to spell out his name in primary colors for a fun pop of color and personalization. Not everyone does a mobile and it’s totally a legitimate thing to skip if money if tight as well, but I think they are adorable and fell in love with this one from Etsy. She is willing to make custom mobiles so I asked for this one but in a cascading color pattern vs rows and minus pink/plus aqua. We have it sitting at home all packaged neatly and I can’t wait to open it all up! There are lots of mobile tutorials out there as well, so DIY is definitely an option! We already own lots of fun details to add to the them and, of course, have been gifted a few extra as well. Funko Pops are perfect for any nerdy room because they cover so many great fandoms; we have Captain America and Jean Grey who represent Bryan and I as our favorites. There are also the most adorable DC themed teddy bears we couldn’t say no to and plenty of nerdy books out there if you go looking. One thing I still would love to add to the room – a superhero costume corner!